To find instructional books for children search the Library catalogue. In the search box enter phrases like "grammar early works" OR "arithmetic early works" and click Search. Scroll down the column on the left hand side of the screen to refine your results by Creation date and click Before 1800. Sort this results list using the drop-down menu under Sorted by in the middle of the screen, to show the Oldest date first. All these books are in our Rare Books Collection, so go to an Inquiry Desk or phone 8664-7002 to request the book to be delivered to the Heritage Collection Reading Room at the next available delivery time. A primer specifically designed by the Puritans for the colony of America was first published late in the 17th century. Our copy of the New England primer (1843) is a 19th century imprint of the 1777 edition. This item is featured in the Library's Mirror of the World exhibition and an electronic version is available on the Internet Archive. 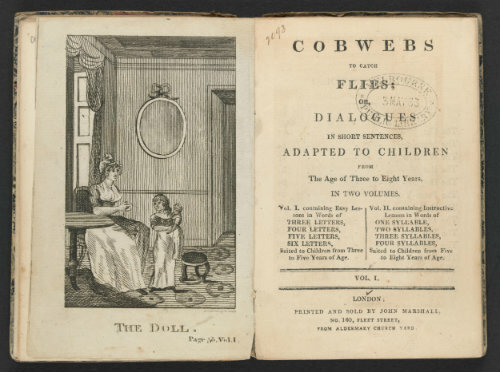 Cobwebs to catch flies by Eleanor Fenn is an instructional book for very young children first published in 1783. Our copy is a 1809 imprint. 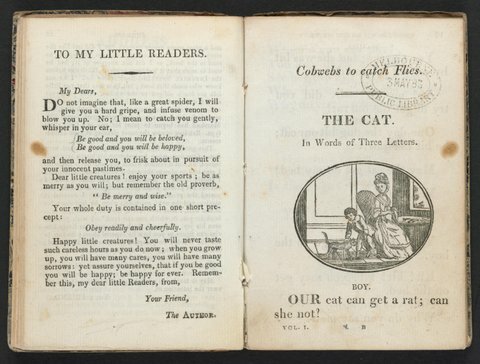 A website that explains the importance of this book and other 18th century British children's books is The Development of British Children's Literature in the 18th Century. A La Trobe Journal article about early instructional books for young children, The ABC of horn books by Juliet O'Conor, includes the New England primer and Cobwebs to catch flies.